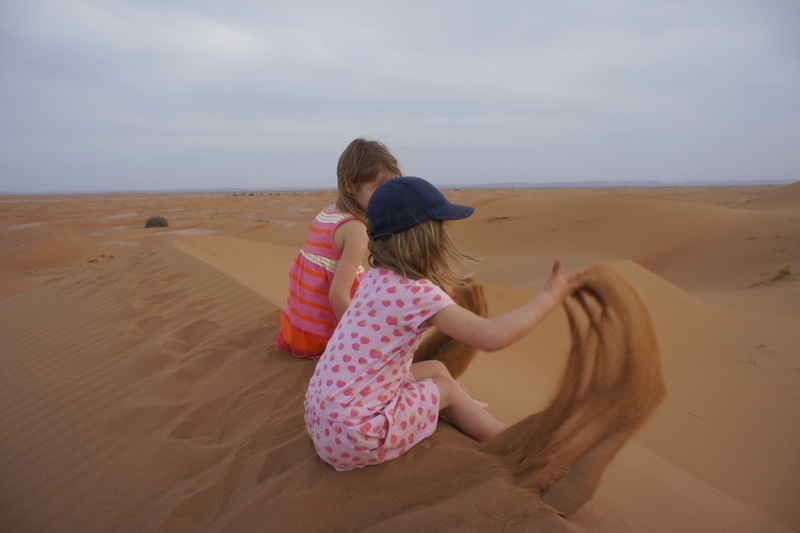 We took our three children aged 6, 4 & 3 to Morocco on a trip to Marrakech and then out to the desert. Our six year old kept a journal of our holiday and has kindly agreed for me to publish it here (with a few spelling corrections). I am 6 years old and I went to Morocco with my Mummy, Daddy and 2 sisters. We went on a plane to get there and we had pancakes at the airport. I watched a film on the plane and did colcour by numbers. Then we went to our hotel, which is called a riad. Then we went to the square and lots of people offered us toy snakes but we didn't want them. It was very noisy - there was lots of drumming. Then I heard the calling for prayer. The man at the top of the mosque sang for people to come to pray, it disn't sound like singing we do at school. I had pizza for dinner. I had breakfast on the roof! Today I drove over a huge mountain. After driving over a mountain I stopped at Ait Ben Haddou. I climbed buildings that looked like enormous sand castles and they were made of sand, mud and straw. I climbed a great stone hill. If you wanted some exercise it was fun. Today I had breakfast by the pool. I loved the view of the pool. I went in the pool and me and Mummy were the only ones in it. We went for a walk and saw lots of cacti and palm trees and Daddy said we were in an oasis. An oasis is a patch of desert where there is lots of water and crops can grow as in the other part of the desert only cacti can grow. We were given peacock feathers. Today I had breakfast by the pool. I had bread, hot chocolare, jam, banana and apple. We had a very long drive throug the rocky desert. First we drove through the rocky desert and then past a few mountains. We stayed at a guest house and our room was in a tent. Nancy the owner showed us her house and paintings. She is an artist. She gave us some post cards that she has painted. After dinner, the men taught me African drumming. Today I had breakfast and cake because it was my sister's birthday and there was lots of drumming. The cake was fantastic. I loved the bongo drumming. In the afternoon we went in Bobo's car to get to a camp in the Sahara. I saw loads of camels. I even saw a baby one. Eventually we arrived at our camp. It was the sandiest place 'd ever been to! There was a brilliant dress up dolls game. Daddy went sand boarding and Mummy read her book. We climbed up a sand dune that was like a mountain. I liked rolling down the dunes. Then Daddy and I found some bones. The camp was so nice, the beds were very comfy. After breakfast we got the car back to Nancy's guest house. After we had a few biscuits we went on camels to another camp in the desert. I went on a white camel, it kepy trying to eat everything. It was very bumpy but I liked it. When we got to the camp, we climbed a huge sand dune and I slid down,. We told stories around the fire. There were no loos, so we had to wee in the desert! Today we woke up in a tent. We had breakfast and did more sliding down the dunes. Then we went back on the camels. We found some shells because there used to be a river but it is all dried up now. When we got back we had a long drive back to a hotel with a swimming pool. Today we had a long drive through the mountains to get back to Marrakech and went to the square and we saw sheep's brains. People eat them in Morocco. We also saw snake charming. We went home in an aeroplane. To see suggested itineraries for a family holiday to Morocco, please take a look here.